Where is Summer disappearing to? 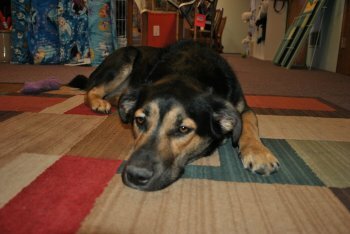 I have not been a happy puppy these past couple of weeks. Too many thunderstorms for me. I hate thunderstorms. All that booming scares me a little bit. Thank goodness, I'm usually with either Mom or Grandma so they can protect me from all that noise. I love to play in the rain, as long as it's quiet. I've been spending most of my Summer laying around inside the cool air conditioning taking several naps during the day. They do call it the Dog Days of Summer, don't they? Mom says I don't ever seem to need an excuse to take a nap. There's a little over a month left in this Summer's Row by Row Experience. 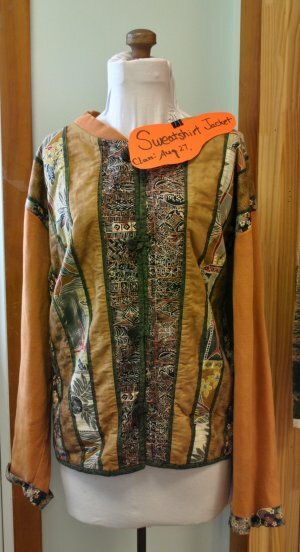 There is still time to go around an pick up your patterns. We, as of yet, do not have a Row by Row Winner in our Shop. 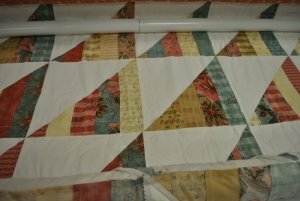 If our Row is in the Winning Quilt, the Winner gets a gift certificate, in addition to the bundle of 25 fat quarters. We have been having fun meeting and visiting with new and old friends during the Row by Row Experience. 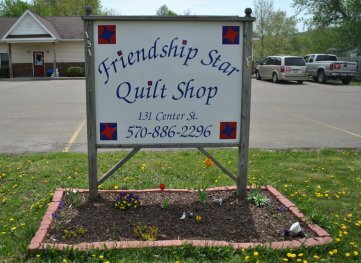 We have fun just meeting and visiting with everyone that comes in all year round. 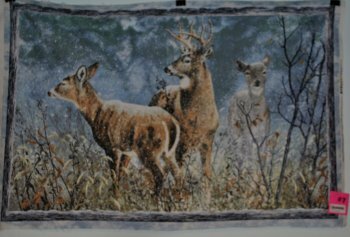 Deer Panel by Wilmington Prints. It's 36" x WOF. It's a huge panel. 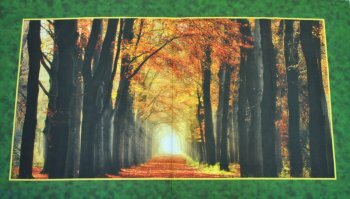 Digital Print by Quilting Treasures. The photo doesn't do it justice! 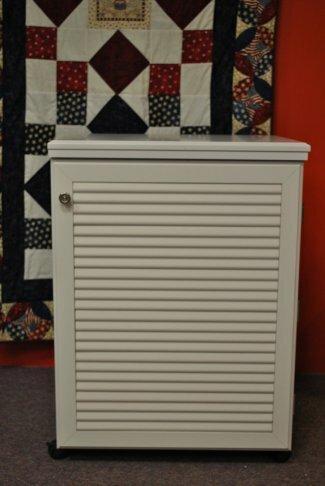 We also have an Arrow Cabinet on display. It retails for $579.99. 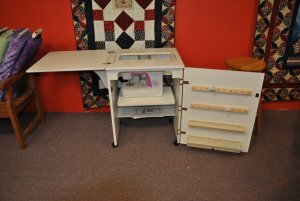 It's a nice medium size sewing cabinet with a hydraulic lift to raise and lower your sewing machine and some storage on the door and under the sewing machine. 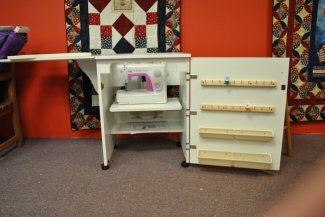 It folds up to half it's size and doesn't look like a sewing cabinet. We picked white but it comes in oak and black as well. 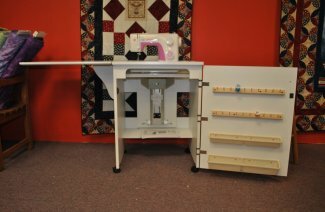 Fold the extension up, close the door and your sewing machine is in hiding. It's on wheels so you can easily move it around to set it out of the way. I helped Mom put the sewing cabinet together. That's why I'm late with the newsletter. I had to move stuff out of her way so she could put it together. I'm a very helpful puppy dog. I love to help Mom. Class Schedule for August. This month I have photos of almost every class. Except, Free Demo Day. 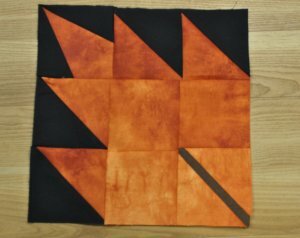 It looks like it's tricky to make but it's not. I don't know what Grandma has up her sleeve this month. if they get too full to finish theirs. We hope everyone is having a great Summer and collecting your Rows. I'm off to help Mom with something. I don't know what but I'm sure she needs my help doing whatever she's up to. If not Mom, then maybe I can help Grandma.